"I certainly see how you've won the IBM awards. I see this product giving us development power like I've never seen before in my 30 years in this profession. Aurora Parts & Accessories, operating from their brand new 300,000 sq. ft. distribution center in Lebanon, Indiana, is a single source OES provider of trailer parts. They maintain control over the largest, most in-depth line of high-quality trailer parts for the transportation industry in North America. To better serve their customers, they have developed a selective distribution strategy made up of more than 250 independently owned dealerships across North America. Reduce customer service overhead and provide key iSeries database information to customers over the Internet. PlanetJ's WOW (Web Object Wizard) was used to easily create a secure web site allowing customers to sign in and view their information. 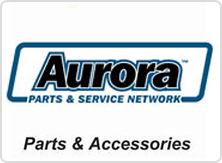 Aurora Parts & Accessories is a leading single-source provider of trailer parts. Aurora sales representatives spent a considerable amount of time on the telephone answering and servicing typical customer inquiries such as "When will my parts be here? ", "Can you get me a copy of the invoice? ", "What is my order total?". The sales representative would look the information up using their iSeries ERP package from DST. Customers often were constrained by call volumes and inquires were limited to normal business hours. Wouldn't it be nice to have this information available on the Internet? This would reduce time spent by Aurora sales representatives and also increase customer satisfaction; a win-win situation. Enter PlanetJ's Web Object Wizard (WOW). PlanetJ's WOW application development tool includes a "self-service" component allowing the easy creation of Internet applications from existing iSeries database files. WOW installs over Apache's Tomcat application server (as well as many other application servers, including IBM's Websphere) and significantly decreases the time required to develop the application. Customers sign-on to "MyAurora" using their user id and password. WOW authenticates, and if authentication succeeds, the user is able to access their information as shown below. End users enter the site from any browser. The firewall securely directs the request to the Apache Tomcat and then onto WOW, which is running on top of the Tomcat application server. WOW and Tomcat were installed on a PC running Microsoft Windows. WOW accesses DST files on an iSeries machine using WOW's high performance JDBC/SQL component. All this was done securely behind a firewall. The resulting Web pages were encrypted using SSL technology further providing another level of security and ultimately returned to the user. WOW and Tomcat can combine to allow companies to quickly and securely build Internet/Intranet applications allowing customers or vendors to access their information. This increases customer satisfaction while reducing information retrieval costs.